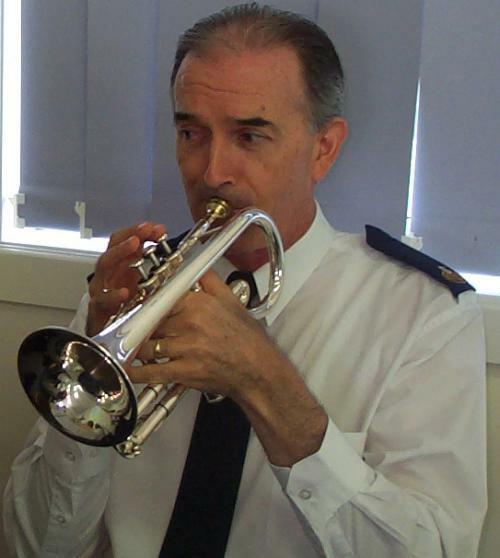 The Pine Rivers Community Band of the Salvation Army (Bandmaster Garry Hughes) journeyed to Casino, New South Wales, for a special weekend 29 April – 1 May 2005. Joining the band as special guest was cornetist and conductor Rodney Everitt. The Community Band is an “augmented” brass band, using the traditional brass band instruments with the addition of woodwinds (flute, clarinet and saxophone) and sometimes bass guitar. The band left early on Saturday morning, arriving in Casino at 11:00 am. The first engagements for the weekend entailed the group splitting into two parts, with the Ladies Band going to a local nursing home and the remainder of the Community Band playing a concert at Bi-Lo. The group joined back together for lunch at the Casino Salvation Army hall, followed by a rehearsal with the special guest for the weekend, Rodney Everitt. The Saturday evening festival opened with Instant Concert!, followed by words of welcome and an invocation by Captain Robert Duncan. Rodney Everitt took the baton to conduct the band in the march Our Great Reward and was then interviewed by Bandmaster Hughes. Everitt then showed his solo virtuosity (he recently achieved a 90/100 score at the Australian championship soloist competition) with the cornet solo A Happy Day. Another solo item, this time on piano, was presented by Elissa Adamson. The festival took on a light-hearted tone with the band playing Hoe Down, featuring Farmer George and Farmer John. This was followed by the march Highland Praise. Paul Sketcher presented the vocal solo Down the Street, and the Deputy Bandmaster, Ken Bamford, conducted another march, The Wellingtonian. Rodney Everitt and John Moore, accompanied by Lorraine Kachel on piano, played the cornet duet Happy Warriors. Everitt again presented a solo item, following a Scripture reading. This time he played the old classic solo Tucker, accompanied by the Community Band. The concert concluded, after a devotional message from Major Terry Smith (R), with Everitt again conducting as the band played the William Tell Overture. The band returned to the Casino Salvation Army hall on Sunday morning for the worship service. The major band contribution to the meeting was The Well Is Deep, with Everitt conducting. Another featured item was His Love Remains the Same, sung by Paul Sketcher with Lorraine Kachel accompanying on piano. In the afternoon, a Praise Concert was presented, opening with All Good Gifts, conducted by Deputy Bandmaster Bamford, followed by some congregational participation. Nathan Piks conducted Our Great Reward, and Rodney Everitt played the cornet solo Wonderful Day with piano accompaniment. Following another band feature, Walk Tall, Rodney again played a solo, Concert Etude, accompanied by Elissa Adamson on piano. The concert continued with the band presenting Gospel Train and yet another solo from Everitt, this time entitled New Life. Scripture readings and congregational songs were interspersed with the feature items. Following a benediction by Captain Duncan, the band played El Toreador as an finale for the weekend. This article was posted in News and tagged Casino, concert, conductor, cornet, Elissa Adamson, Garry Hughes, John Moore, Ken Bamford, Lorraine Kachel, ministry weekend, Nathan Piks, New South Wales, Paul Sketcher, Pine Rivers Community Band, Robert Duncan, Rodney Everitt, visitation, worship on 9 June 2005 .